With her quizzical expression and frizzed dandelion-head of electric auburn hair – one part 80s synth-pop album cover, another Pre-Raphaelite Brotherhood heroine – the fashion editor Grace Coddington, creative director-at-large for American Vogue, has a visual imprimatur that is immediately recognisable. For one, it can be spotted staring stoically from decades of catwalk-side reportage images, like a high fashion Where’s Waldo, except far easier. She’s still there today. Bar being born on the island of Anglesey in Wales, Coddington is an archetypal English eccentric, in both that she refuses to conform to expectations, and her boundless imagination. Coddington’s body of work comprises images that, in short, have helped define the identity of fashion today. “Grace Coddington is the unassailable fashion editor par excellence,” proclaimed Hamish Bowles, Vogue’s international editor-at-large, in the 2012 documentary The Editor’s Eye. He’s erudite, and basically correct. Besides defining her field with images romantic and poetic and sometimes magical, Coddington also adores cats, has two named Blanket and Pumpkin, and has dedicated a book to them (The Catwalk Cats) as well as the stopper of a mono-eponymous fragrance, Grace, released with Comme des Garçons two years ago. Eccentric indeed. Possibly in homage to Coddington’s eccentric style and styling, Ghesquière’s clothes were wilder and freer than ever before, mixing patterns and shapes and colours. A sweater may be intarsia-ed with Vuitton malletier buckles or a checkerboard referencing the house’s Damier pattern, emerging helter-skelter after reconfigured Liberty-esque micro florals, or plissé Princess Leia dresses in pristine white. They marched on pumped-out moulded sneaker-boot hybrids through the Joan Miró labyrinth – 250 works, mainly sculptures, scattered over the exterior terraces of the Maeght Foundation, a modern art museum perched on the Colline des Gardettes, a hill overlooking the village of Saint-Paul de Vence close to Cannes (but we know all about that). The labyrinth is intended to be a voyage through the artist’s mind and that notion of voyage is, of course, very Louis Vuitton. And in a sense, this collection felt like a voyage through both Ghesquière’s mind and Coddington’s, an oddly balanced interplay between two very different aesthetics, the romantic and the futuristic, the nostalgic and the Modernist. 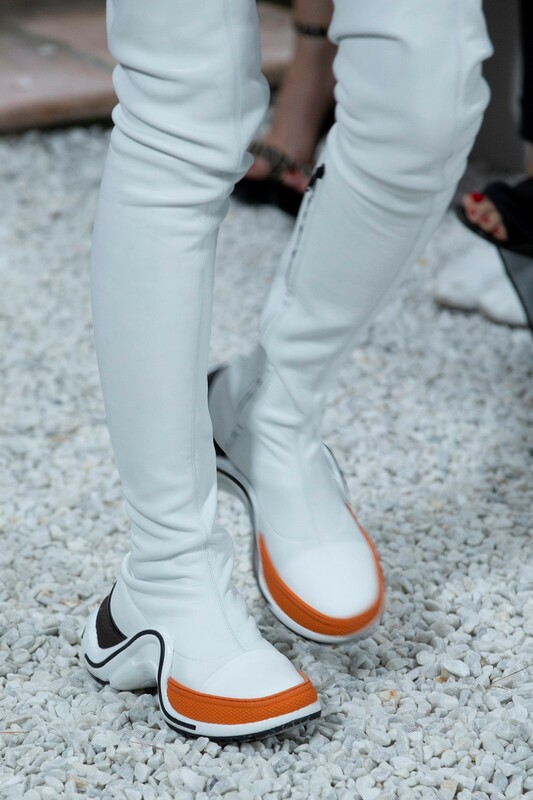 The interplay energised the show in much the same fashion as Ghesquière’s greatly acclaimed Spring/Summer 2018 offering, where French 18th-century court costume, teamed with booty shorts and those springy sneakers, became a form of dynamic armour for the 21st century. Bar her hair, the collection also featured a direct collaboration – a playful, definitely eccentric selection of Louis Vuitton handbags based on sketches by Coddington of her own two cats, and Ghesquière’s dogs. Oddly, not the first time these two talents have collaborated on fashion in such a fashion, in 2012 Coddington and Ghesquière, who was then creative director of Balenciaga, created a capsule of accessories bearing Coddington’s drawings of one of her aforementioned Persian cats, Pumpkin. 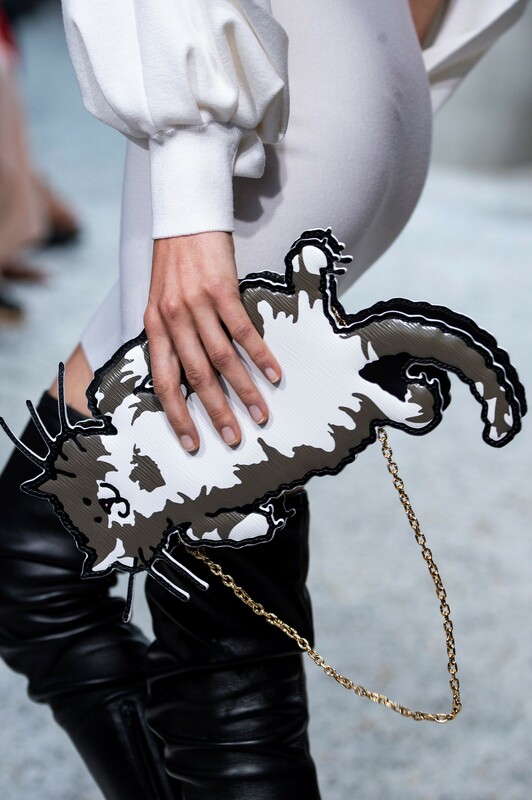 This time, the idea was pushed to an extreme – the cats were prints on remixed-but-classic Vuitton bags, depicted toying with Ghesquière’s dogs, but also emerged as idiosyncratic clutch-bags, entirely shaped like a flat feline doodle. Eccentric, yes. I couldn’t help but think of the English colloquialism: mad as a bag of cats. They were, and were. That’s the link between Ghesquière and Grace, but there’s even one to be found between Coddington and Vuitton – a particular shade of soft satsuma, dubbed ‘Vuittonite orange’ after the washable and stain-resistant canvas used in their trunks at the turn of the 19th century. It’s kind of the colour, coincidentally, of pumpkin.